According to the Indian tradition, Mangalsutra is more than just a piece of jewellery. It is a symbol of a sacred union that beholds the testament of love and a life-long commitment. The roots of this auspicious thread can be traced to South India, Tamil tradition to be precise, which was slowly adopted into the wedding rituals of other regions of the country. Even today, the groom clasping this black and gold beaded necklace around the bride’s nape is the most awaited and emotional part of a wedding ceremony. This deep-seated tradition still holds its emotional value and continues to be an important part of the Indian tradition. 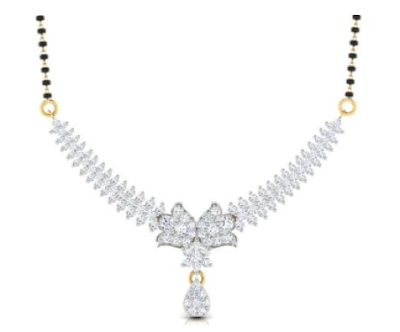 However, what has changed are the Mangalsutra designs. If you want an extravagant yet elegant design for a Mangalsutra, look no further than the “Tilaka Magalsutra.” The crescent-shaped design, studded with 118 individual pieces of diamonds makes this ornament a sought-after piece. The design is available in both white gold and yellow gold that further enhances the appeal of this uniquely crafted jewellery. Sruti which stands for musical intonation in the Vedic texts adeptly justifies the nomenclature of the design of this Mangalsutra. The thin thread of beads and gold that holds together a golden embellishment in the center is very traditional yet minimalist in its appeal. The elegant design of this auspicious thread will certainly win the heart of a bride who likes to keep things simple. 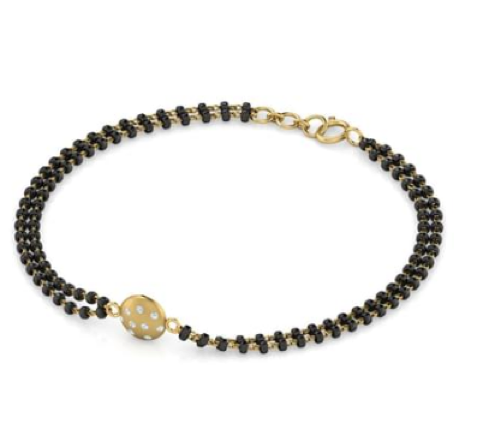 Sleek yet stylish, this beaded beauty will effortlessly complement the everyday look. The diamond studded floral motif in the center is yet another highlight of this Mangalsutra that makes this design a sure-shot winner. 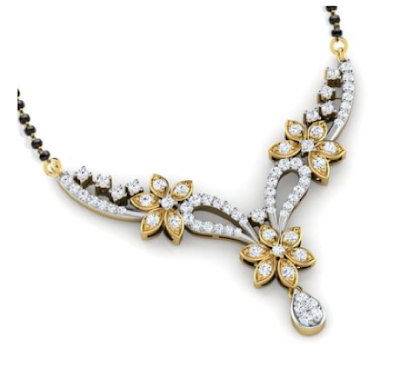 For starters, this exquisite floral design is available in both Yellow and White Gold. This pattern used for this Mangalsutra incorporate various design elements. The two inverted paisley designs with studded diamond rims holding flower petals and a drop design make this ornament standout, to say the least. The design of this thread of love is a significant departure from most quintessential Mangalsutra. 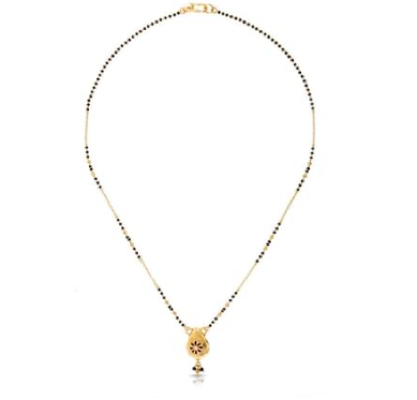 In fact, the black beaded sutra of this neckpiece is the only tell-tale sign that indicates it is a Mangalsutra. The central design symbolizing eternity depicts a loving embrace between the newly wedded couple. The neat row of diamonds flawlessly encapsulates the representation of love and togetherness. Resembling an inverted tiara, this uniquely crafted Managalsutra is a sight to behold. Every stem of the crown-like design is adorned with a beautiful diamond. This design makes the best use of diamonds in a jewellery piece which is inherently traditional. 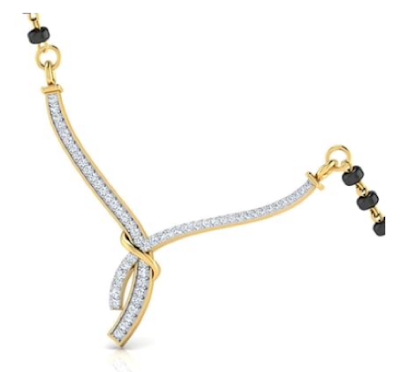 Ending the list on a modern quotient, the Viragi Mangalsutra Bracelet is an epitome of contemporary. Modern brides who are not keen on wearing the traditional Mangalsutra can instead opt for a black beaded bracelet which is chic in every sense of the word. 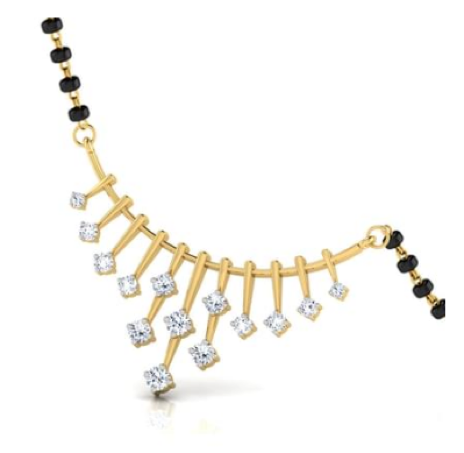 This is a unique piece of jewellery that has been adored by Bollywood Celebrities like Shilpa Shetty. 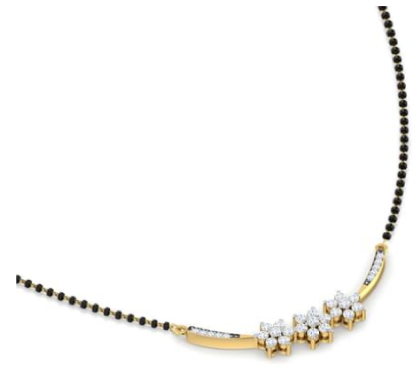 This Mangalsutra design will certainly suit the taste of a fashion forward bride. Platforms like CaratLane are redefining bridal jewellery assemblages by introducing designs that capsulate tradition in a unique and modern way. The string of Mangalsutra listed on the website represents the same ethos and design philosophy. 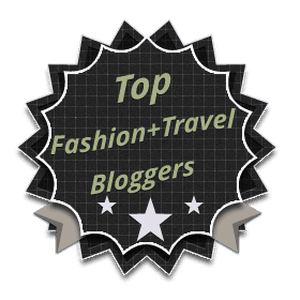 So, if you are a new-age bride or a bride-to-be, choose from any of the extravagant designs showcased above to give your married avatar a modern yet traditional appeal!